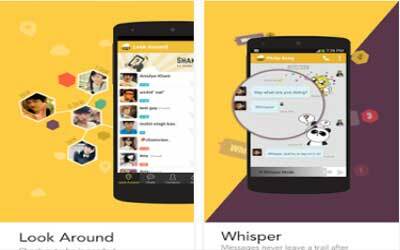 Compared to any other chatting and messaging applications, BeeTalk APK 2.1.7 has cool features. It has basic features such as chat, group chat, and voice message as it goes for any chatting and messaging applications. However, it has various features that you cannot find on those other applications. In this article, we are going to discuss more about the cool features on this messaging application. Without any further ado, here are those cool features. The first is shaking features. You can add your nearby friends on your contact simply by shake your device. The system on your Smartphone is going to locate any device shaking at the same time. This feature definitely allows you to add many contacts easier. In addition, it is the most interesting feature that cannot be found in any other messaging application. Generally, you need to add contact by series of pin codes or phone number. By using this feature, you do not need to memorize such thing. Simply shake your gadget at the same time as your friends and you will get their contacts. Moreover, there is also whisper feature. It allows you to send message that will automatically disappear after certain second the receiver read it. It is the most suitable for secret massage. Furthermore, this app also offers doodle feature. Stickers and emoticons are mainstream on messaging application, so BeeTalk allows you to send your own doodle to your contact. The most popular cool feature is called buzz. Besides serving as chatting and messaging application, you can also use it as social media. You are able to update your status or sharing photos and videos on your timeline. Your contact can give comment on your status and upload. BeeTalk for Android is recommended for you who want to get messaging application with various great features and serves as social media app.